On Episode 198 of CrossFit Radio, host Justin Judkins interviewed 2011 Reebok CrossFit Games fifth-place finisher Julie Foucher and CrossFit 810 owner Joe DeGain. This episode was webcast live at 6 p.m. PDT on Wednesday, Nov. 16, 2011. 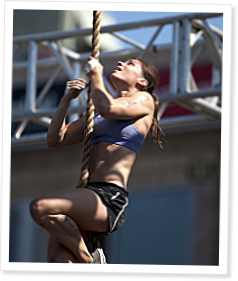 6:25 Julie Foucher placed fifth at the 2010 CrossFit Games and showed her consistency with another fifth-place finish at the 2011 Reebok CrossFit Games. Foucher came on the show to speak about her Games experience and how she realized her growth as a CrossFitter while competing this past summer. She spoke about the different Games events and described why the Dog Sled workout was her favorite. Finally, Foucher explained how she manages to train consistently while attending medical school and talked about how CrossFit became an instant addiction for her. 29:40 Joe DeGain owns CrossFit 810 in Grand Blanc, Mich. He described how he tries to think outside the box when it comes to improving the athlete experience at his box. With the Games season approaching in the New Year, Degain talked about a group of his athletes who just competed in their first CrossFit competition, and he described how he balances his programming and coaching for those who want to compete and those who just want general physical preparedness. He also talked about creating and fostering community and gave advice on how he would handle certain coaching situations that come up.